Today 1,800 seedlings will be placed into the earth. As each tree takes root, it will grow and flourish into a living memorial. The trees are being planted as part of the Bristlecone Foundation Legacy Forest. 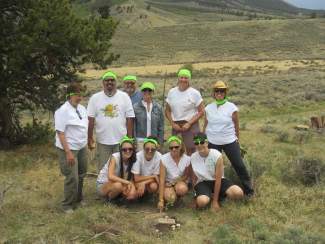 Six thousand trees have already been planted in Summit County in memory, or in honor, of a special person. “We felt that not everyone knew about our services, and we wanted to do something meaningful for people in Summit County,” said Asa Armstrong, the development officer at the Bristlecone Foundation. Every seedling volunteers plant today will benefit the foundation, which provides homecare and hospice services for those in Summit County and in surrounding areas who have limited or no health insurance. “Right now, Bristlecone health services is the only fully licensed homecare and hospice in the County,” Armstrong said. “If Bristlecone wasn’t there, patients would have to leave Summit County to find services,” she said. This would put an extra stress and burden on families of patients who aren’t mobile, Armstrong said. The Legacy Forest started in 2010 as a way for community members to pay homage to a loved one they had lost. Since then, it has expanded into a celebration of any loved one — and can also commemorate a birthday, wedding, birth or other major life event, Armstrong said. Legacy Forest organizers expect about 150 volunteers at today’s event. “Asa has worked so hard on the Legacy Forest and it’s been amazing to see the community respond,” said Paige Leonard, a consultant to Bristlecone Health Services. The seedlings being planted today include aspen, bristlecone pine, Colorado blue spruce, ponderosa pine and Engelmann spruce. “By planting a mix of seedlings, we are contributing to a diverse forest, and that is a healthy forest,” said Kate Zander, a Friends of the Dillon Ranger District employee who is contributing to the project. Zander said the friends are happy to help the Bristlecone Foundation make their mark on the forest. The Summit County Open Space and Trails Department and the towns of Breckenridge, Dillon, Keystone and Silverthorne also contribute to the effort. “It’s really fun to work together because it benefits our community, our neighbors and our loved ones,” she said. Community members can purchase seedlings throughout the year. Visit http://www.bristleconefoundation.org or call (970) 668-8444 to buy a seedling or make a donation.